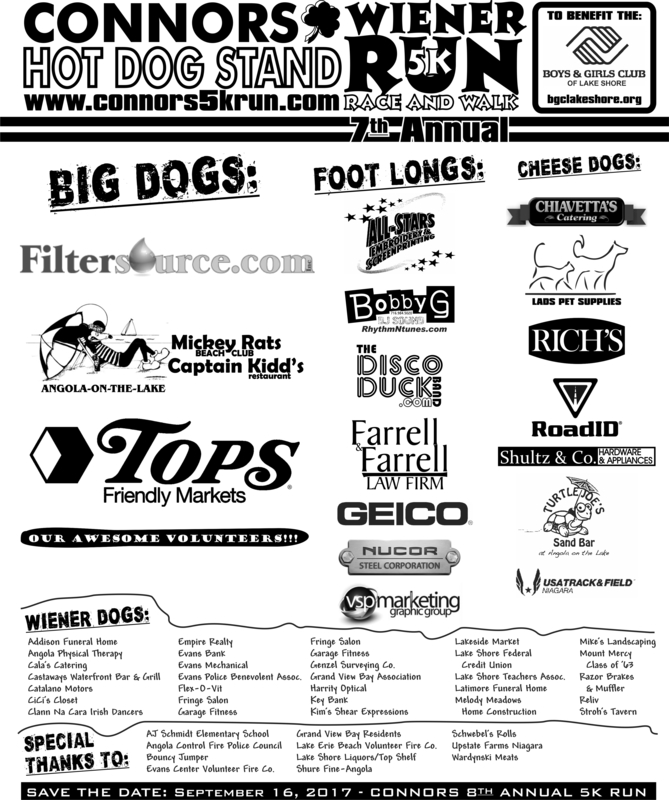 The Ninth Annual Connors Hot Dog Stand 5k Run is scheduled for Saturday-September 15th starting at 10am. The race will follow the usual scenic path along the lake from the Evans Town Park to the AJ Schmidt Elementary School, looping back to the finish line. This year’s post-race party will once again feature a DJ/Sound System and Live Music; along with a free hot dog and refreshments. A huge theme basket raffle will be available before and after the race with the drawing conducted at the conclusion of the post-race party. Please contact Lynn Krajacic at 716-341-9853 or krajacic2014@gmail.com to donate raffle items. Join us in running or walking along the beautiful Lake Erie shoreline and help us raise money for the kids attending our Boys & Girls Club of Eden-Lake Shore to BE GREAT! 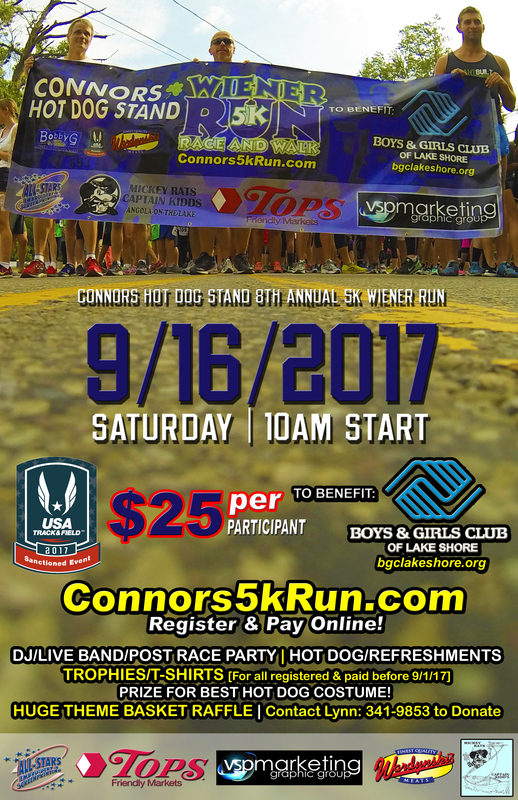 Registration for the Eighth Annual Connors Hot Dog Stand 5k Wiener Run & Walk opens July 1, 2017. This year’s post-race party will once again feature a DJ/Sound System and Live Music; along with a free hot dog and refreshments. A huge theme basket raffle will be available before and after the race with the drawing conducted at the conclusion of the post-race party. Please contact Lynn Krajacic at 716-341-9853 to donate raffle items. Join us in running or walking along the beautiful Lake Erie shoreline and help us raise money for the kids attending our Boys & Girls Club of Lake Shore to BE GREAT! PS – You can really help us make the race successful by printing, posting and sharing these race posters and flyers on your social networks and in businesses and public places around your neighborhood. If a picture paints a thousand words, what more can these 590 photos say than THANK YOU! to everyone who helped make our 7th Annual Wiener Run yet another huge success. 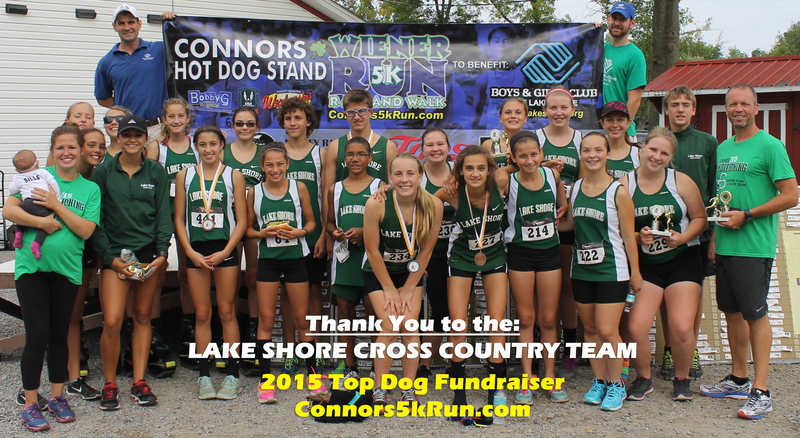 This year’s race helped raise thousands of dollars to support the all-important mission of the Boys & Girls Club of Lake Shore. 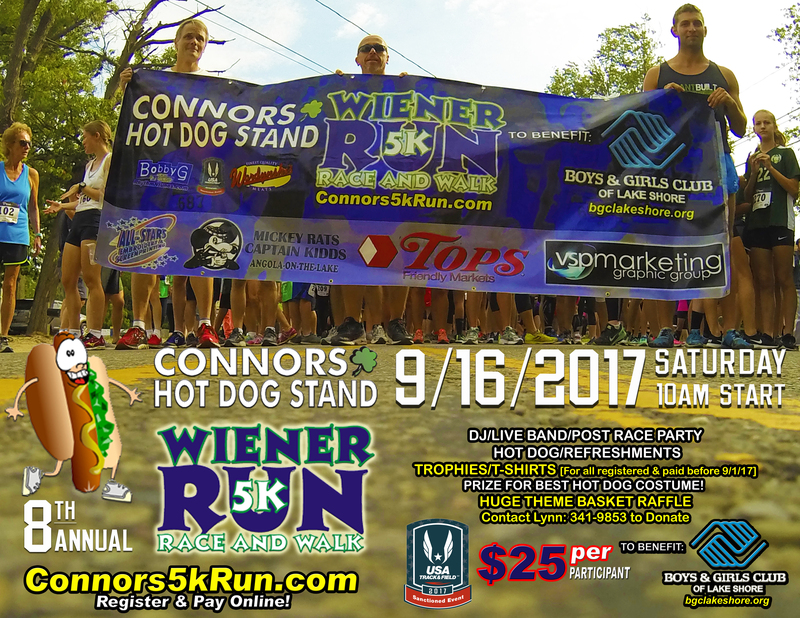 We are now accepting registrations for the 2016 7th Annual Connors 5K Wiener Run to be held on Saturday, September 17th. Click on the “Register Today” tab above to get started! 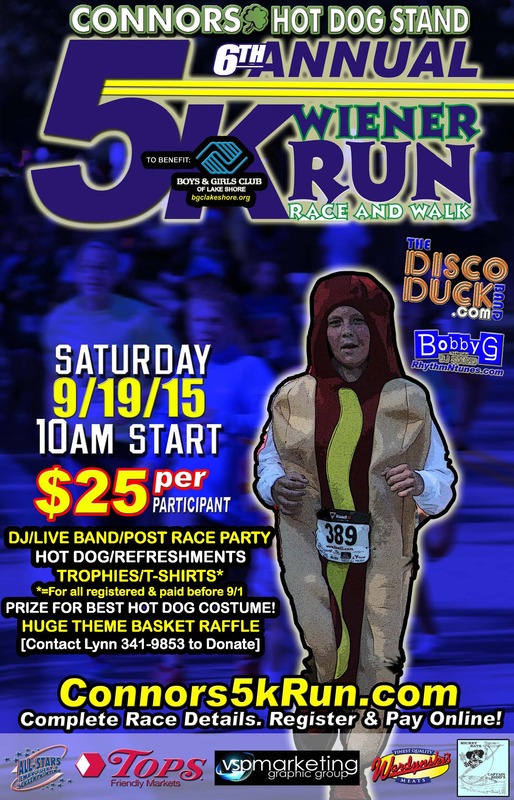 REGISTER ONLINE NOW FOR THE 6TH ANNUAL 5K WIENER RACE!!! The 6th annual race is a little over two months away! Registration is $25.00 for all participants (pre-registered or day of). The ONLINE REGISTRATION for the race is up and running. Visit http://www.raceroster.com and search for the Wiener Run or click the link below. You can register yourself, someone else, your team, sponsor a racer, or make a donation to our cause, THE BOYS & GIRLS CLUB OF LAKE SHORE. This option is the fastest and easiest way for participants and volunteers to sign up. Please note that there will be a processing fee (as there is for most races) for all transactions completed on raceroster.com. We encourage you to use raceroster; but if you would prefer, registrations will still be accepted at the Club (42 Sunset Blvd. Angola, NY 14006) and in person the day of the race. This year ALL pre-registrants will receive a long sleeved 2015 race shirt as long as they are registered BEFORE LABOR DAY (September 1st). After the race be sure to stay for the after party which will include the KIDZONE (face painting, bounce houses, and Teri-Okie the Clown), live music by DJ Bobby G from Rhythm N Tunes Sound and the Disco Duck Band! There will be a HUGE basket raffle and new this year “Penny Raffle” for chances to win cold hard cash! 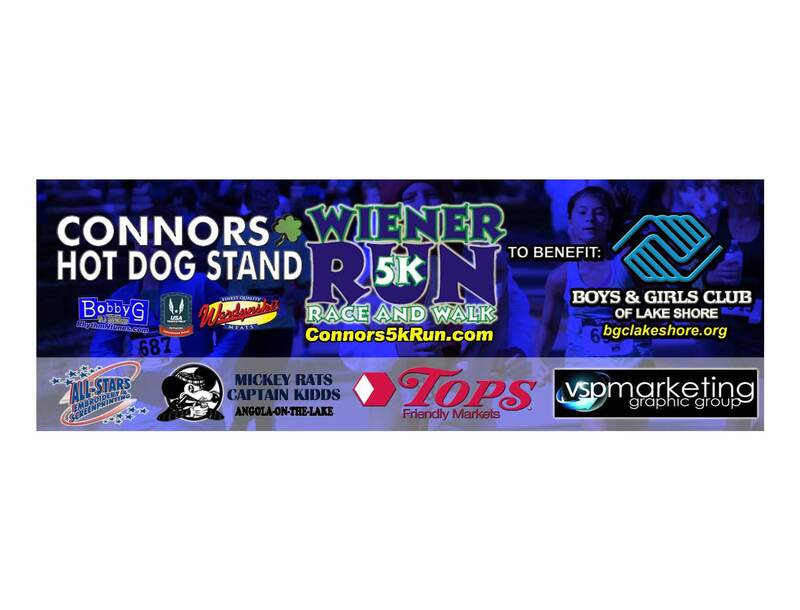 We want to make this year the biggest & best Wiener 5K ever! We are truly looking forward to this year’s event and hope to see you all on September 19th!